Use Novel-Ties � study guides as your total guided reading program. Reproducible pages in chapter-by-chapter format provide you with the right questions to ask, the important issues to discuss, and the organizational aids that help students get the most out of each book they read. About Ann Cameron (Author) : Ann Cameron is a published author of children's books and young adult books. 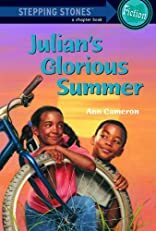 Some of the published credits of Ann Cameron include Colibri (Unabridged), The Julian Stories (Unabridged).